There's something to be said about not giving a flying crap. I gave a crap about Jason Bourne and this happened. But, this, I just don't care. Iron Man (2008) - Don't remember it. But I like the song. Captain America: The First Avenger (2011) - Turned it off 90 minutes in because I would have rather watched a real cartoon or a real movie. Guardians of the Galaxy (2014) - This one was pretty fun. Cool cast. The soundtrack stuff was fun. The villain guy though...one of the worst villains in the history of movies. Avengers: Age of Ultron (2015) - Why am I here? And who are all these people? And why does the whole world keep blowing up? And why is it in mid-air? Ant-Man (2015) - It's less than two hours, and it's still a good movie? No way! And the dude who decided to stage a fight inside a briefcase with The Cure on the soundtrack. Thank you. And thank you Paul Rudd as well. And thank you Evangeline Lilly...for still being in stuff. Man of Steel (2013)- Turned if off 90 minutes in, so I could wash the grey dust out of my eyes. ...Not giving a crap allows one to simply have fun watching a fun movie. 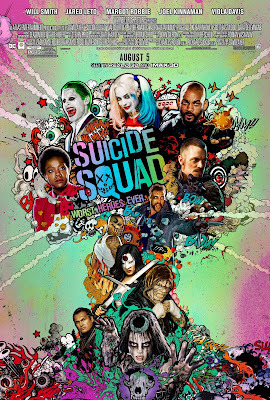 That is all David Ayer's Suicide Squad is, and I'm quite sure all that it was meant to be. And I can get away without overly bitching and nit-picking it apart because...well...I simply don't care to. And I'm not trying to be mean to fanboys and fangirls who are. (I'm sorry you keep seeming to get hosed by the studio suits and critics.) But I had much more fun than most comic book fans and artsy critics (which I sort of am) because I had no dog in the fight. And I didn't expect a "good" movie. I never do. I'll start with agreeing with the bad. There has been a misstep in storytelling and character development here. There are obvious gaping holes in the plot. There are some suspect edits, specifically one that all but removes Adam Beach as Slipknot from the movie entirely and many others involving The Joker, who you would've though would've been the main character after all the 2015 San Diego Comic Con brouhaha. I assume some of this has to do with what I've been hearing about how Warner Bros. went in and screwed with the editing process. That may or may not be true. I don't care enough to dig. So, why did I even go see this movie? It seems like I'm not the audience for it...and I'm not. But anyway... First and foremost, Margot Robbie is the stone fox to end all stone foxes. (My wife is allowing me to think that and even say it...this one time.) And she kills it as much as I thought she would given all the promotion of her character in the last year or so. Second, I happened to be in Toronto as they filmed the exteriors for the pink Lamborgini chase (a mere ten seconds of the movie that I watched them film for about an hour). Third, after the crap reviews from the critics and bitching from SOME fans, I felt like I definitely needed to see it for myself. Then, there's the intriguing director David Ayer, a filmmaker I am most familiar with as the writer of Training Day, one of the most memorable movies of my adult life. He went on to direct hard-hitting street grit like Harsh Times with Christian Bale and End of Watch with Jake Gyllenhaal. I've seen neither of those. He then went on to direct the minimal WWII film Fury, which spends the majority of its time inside a Sherman tank. I found it merciless in its violence...in a good way. Thin on story and character...in a bad way. That's about the same thing I could say about Suicide Squad. The good outweighs the bad for me in both films. The plot, as with most comic book universe movies of late, is so full of so many characters and settings and backstories that I can scarcely waste the time and inches of copy it would take to go all the way there. Plus, I'm lazy. So, I'll just be brief and not include everybody. There is Deadshot (Will Smith), the best and most dangerous sniper in the world; Harley Quinn (Margot Robbie), the deranged ex-therapist girlfriend of The Joker; Diablo (Jay Hernandez), the barrio boy made of flames; Killer Croc (Adewale Akinnouye-Agbaje), who lives underground and is half croc; and Boomerang (Jai Courtney); an Aussie jewel thief who like boomerangs and pink unicorns. All are currently in a major maximum security prison in Louisiana. They are really BAD! The way they are introduced with Waller reading their dossiers to one of the Joint Chiefs is a shining example of why I love movies, in general. It is stylish and fun, full of great soundtrack choices. I mean GREAT! And I won't spoil them either. It is fast-paced, slick, just cool. Hilarious titles in various fonts flash on the screen, introducing them all, cut in with flashbacks, all action, nicely assembled for the most part. I could honestly watch the first half hour of this movie all day, despite the unequal balance in development. Much of the humor of the first bit comes from interactions between the various squad members and the guard they mutually hate, Griggs (Ike Barinholtz). He shares some great exchanges with the Will Smith character, most notably in the scene where Waller brings her guy, Army man Rick Flag (Joel Kinnaman), who will lead the criminals and villains into battle (and also "golfs with a 3 handicap"). Once the squad is complete, it is essentially standard superhero movie fare, total death and destruction. The crew joke and shoot and argue through the devastated streets of an evacuated city, coming to terms with their past mistakes and how it all might have been. Some care more than others. Will Smith's Deadshot carries a good deal of the dramatic weight with Jay Hernandez's Diablo getting the triumph, both with backstories about wives and/or children that took a backseat to their criminal lifestyles. But the movie belongs to Robbie. Harley Quinn's story is the most simultaneously involving and underdone. That has to do with the structure of the movie itself, and the very nature of The Joker (Jared Leto) as a subplot, essentially a series of flashbacks. Leto is fine, maybe could've been better given some more time, but Robbie's work is the real win for this movie. She is downright hilarious, having immense amounts of fun with the role, and is a dynamite presence. The others are just comic relief in a movie where everyone gets at least one comical moment. The comedy worked well for me, even when Will Smith all but looks right at the camera and says something like, "Don't forget. We're the bad guys." Honestly, at some point I decided to believe that this flick is bad on purpose, which made me not feel so bad for pretty much loving every silly minute of it. And that's just as well. You see, it's like I said. I just didn't care. I wasn't looking for a great movie. I wasn't even particularly pumped up about seeing it. When that's the case, a movie can defy your expectations. It can become just about having fun seeing a weird, sometimes cool, often funny action movie. And that's Suicide Squad. Cool, weird, bad, awesome, fun. Other than that, I don't care. I liked it. It does what I think it was meant to be: an action-filled summer blockbuster. I'm usually not into those, but superhero films (& Star Wars) are the exception for me. I give it 3 out of 4 stars. Robbie brought this movie from "mediocre" to "good" for me. Leto was great, but it didn't really matter whether he was in there or not, because it felt like he was in there for 5 minutes. I'm usually more of a Marvel guy than a DC guy. I've seen all the Marvel movies (MCU & X-Men), but I haven't seen all of the DC (haven't seen Man of Steel or Batman v Superman). I feel like Marvel's movie have a better plot than DC. Marvel has definitely been better than DC the last few years. Marvel has been making great movie after great movie. DC's last great movie was The Dark Knight Rises. However, I am excited for the new Batman stand-alone movie that's going to be written & directed by Ben Affleck. I feel that with him helming the film, & writing the script, it'll be better than the last few DC movies. Agreed on Robbie. And this movie is just fine. I had fun. That's all that I was hoping for. I liked some of the songs in the soundtrack, but put together I thought they were pretty terrible. It's probably good you didn't care to nitpick, that's all I did. But it was fun though. Bad fun at parts, but never boring. Never boring goes a long way for me these days. I'm planning on seeing this soon - I just know I have to be in the right mood to even attempt to enjoy it. I'm kinda burnt out on the comic book movies to be honest (I COULD. NOT. with Capt. America Civil War, and I LIKE the Avengers movies, especially the Capt. America ones! ), they just all feel the same at this point. Mostly I'm coming here to say: PLEASE I'M BEGGING YOU, DON'T WASTE YOUR TIME WITH BATMAN V. SUPERMAN. I mean, I'm fascinated by that movie and how/why it went so wrong, but it is really NOT good and so unbelievably not worth two and a half hours of your time. This is worth seeing, man. Honestly. It is actually pretty bad. What they say is true. But it's a fun time at the movies if you let it be that. "Cool, weird, bad, awesome, fun." Yup, that about sums it up. Right!? Why do we need anything more in a summer blockbuster? 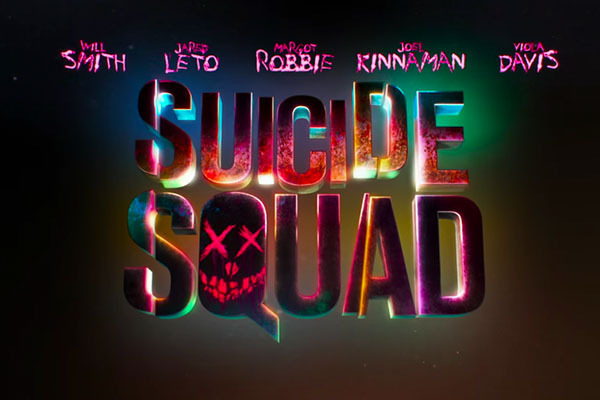 Definitely an entertaining flick and completely dominated by Margot Robbie!